Objective: To assess the extent to which different forms of summarising diagnostic test information influence general practitioners' ability to estimate disease probabilities. Setting: Three Swiss conferences in continuous medical education. Intervention: Questionnaire with multiple choice questions about terms of test accuracy and a clinical vignette with the results of a diagnostic test described in three different ways (test result only, test result plus test sensitivity and specificity, test result plus the positive likelihood ratio presented in plain language). Main outcome measures: Doctors' knowledge and application of terms of test accuracy and estimation of disease probability in the clinical vignette. Results: The correct definitions for sensitivity and predictive value were chosen by 76% and 61% of the doctors respectively, but only 22% chose the correct answer for the post-test probability of a positive screening test. In the clinical vignette doctors given the test result only overestimated its diagnostic value (median attributed likelihood ratio (aLR)=9.0, against 2.54 reported in the literature). Providing the scan's sensitivity and specificity reduced the overestimation (median aLR=6.0) but to a lesser extent than simple wording of the likelihood ratio (median aLR=3.0). Conclusion: Most general practitioners recognised the correct definitions for sensitivity and positive predictive value but did not apply them correctly. Conveying test accuracy information in simple, non-technical language improved their ability to estimate disease probabilities accurately. General practitioners are expected to be proficient in integrating diagnostic information from history taking, physical examination, and other diagnostic procedures. Effective therapeutic action rests on the correct interpretation of such data. Usually, the accuracy of tests is reported in terms of their sensitivity, specificity, and predictive values. Where the prevalence of disease is low most doctors grossly overestimate the probability of disease in patients with a positive result from a screening test.1 They seem to confuse the sensitivity of the test with its positive predictive value. 2 3 Less is known about doctors' understanding of test accuracy data in settings with a higher prevalence of disease. We therefore presented a structured questionnaire with a vignette of a clinical problem to general practitioners. Our primary aim was to assess the extent to which different forms of presenting test accuracy information affected the doctors' estimates of the probability of disease. We recruited general practitioners attending three conferences on continuing medical education in Switzerland. On average, the participating doctors had more than 10 years of professional experience. Although general practitioners do not formally act as gatekeepers in Switzerland, they are usually the first healthcare providers to be contacted when new medical problems arise. The questionnaire, which was developed and piloted in a different group of 45 doctors, consisted of two parts (see bmj.com). The first part consisted of multiple choice questions that asked for the definition of the terms “sensitivity” and “positive predictive value” (from a choice of four possibilities) and for the probability of disease when a screening test with a sensitivity and specificity of 95% returns a positive result in a population with a disease prevalence of 1% (from the choices <25%, about 50%, nearly 100%, and “Don't know”). The second part evaluated the participants' ability to apply these terms to a clinical vignette. Firstly, they were asked to estimate the probability of endometrial cancer in a 65 year old woman with abnormal uterine bleeding (for simplicity, the prevalence of endometrial cancer in all women with abnormal uterine bleeding was given as 10%). Secondly, participants were asked to estimate the disease probability given the result of a transvaginal ultrasound scan. The test result was provided in three different versions: “Transvaginal ultrasound showed a pathological result compatible with cancer”; “Transvaginal ultrasound showed a pathological result compatible with cancer. The sensitivity of this test is 80%, its specificity is 60%”; or “Transvaginal ultrasound showed a pathological result compatible with cancer. A positive result is obtained twice as frequently in women with an endometrial cancer than in women without this disease.” The third version was intended to present the positive likelihood ratio of 2 in non-technical language. Participants received a questionnaire presenting the test result in one of three versions, the allocation being concealed. The questionnaires were handed out before a lecture on evidence based medicine, and the participants were given 10 minutes to complete them. If any of the participants attended more than one of the conferences, we included only their first questionnaire in the analysis. For the three multiple choice questions, we calculated the proportions of doctors (plus 95% confidence intervals) who chose the correct answer. For the second part of the questionnaire, we derived the implicitly attributed likelihood ratios (aLR) by comparing the given probability of disease (10%) with the participants' estimate of probability after being given information on patient's age and result of ultrasound scan. We used the equation aLR=post-test odds/pretest odds, where odds=probability/(1−probability). Likewise, we calculated the likelihood ratio attributed to the positive ultrasound result (probability estimate based on age and test information compared with probability estimate based on age alone). To avoid needless missing values, we converted eight post-test probability estimates of 100% to 99.999%. We made an overall comparison between the three versions of the test information using the Kruskal-Wallis test using SAS statistical software (version 8.1, SAS, Cary, NC, USA). We tested other differences using the Mann-Whitney rank sum test. To obtain an empirical likelihood ratio of endometrial cancer in a 65 year old woman with abnormal uterine bleeding, we used data from 248 consecutive outpatients presenting with abnormal uterine bleeding at the Birmingham Women's Hospital rapid access ambulatory diagnostic clinic (RAAD) between November 1996 and December 1997.4 This database contains information on patients' age and uses endometrial biopsy as the definitive test for cancer. In this database women aged 60-70 with abnormal bleeding are 3.1 times more likely to have endometrial cancer than younger women. The sensitivities and specificities for transvaginal ultrasound that we provided approximated to the median values given in the literature, 5 6 with rounding to simplify calculation. In the clinical vignette, providing the information that the woman was aged 65 led 48% of participants to change their estimates of the probability of disease. 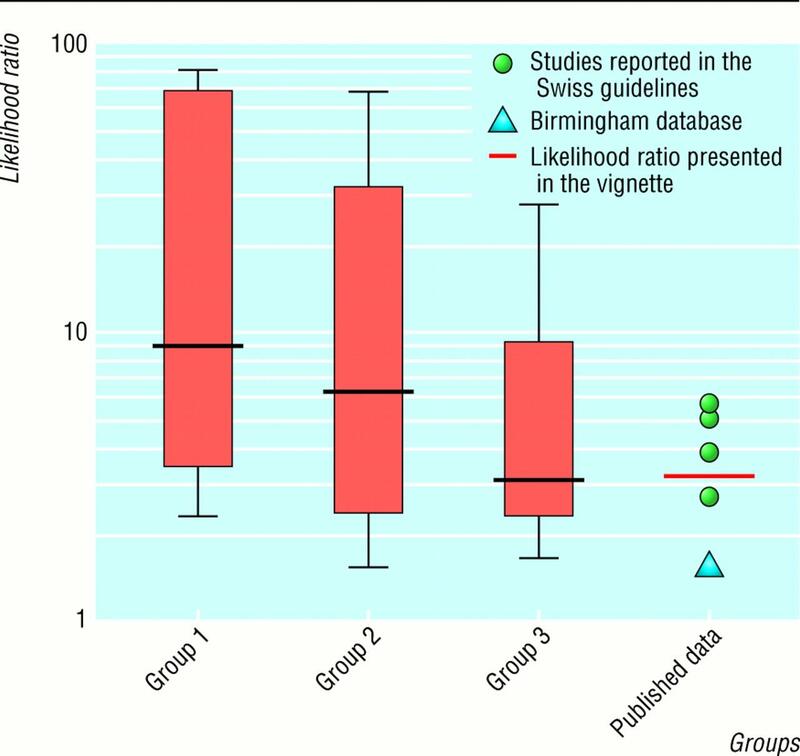 The figure shows the effect of presenting the results of the ultrasound scan in three different ways, with the three groups producing significantly different attributed likelihood ratios (P=0.0013). The 92 participants who were not given any information on the test's accuracy seemed to grossly overestimate the probability of endometrial cancer (median attributed likelihood ratio (aLR) 9; interquartile range 3.25-68.5; P=0.0006 compared with the other two groups combined). The 92 doctors provided with the sensitivity and specificity of the scan had lower estimates of the likelihood of disease (aLR=6; 2.3-22.1; P=0.019 compared with group 1). The 79 doctors given the test accuracy in plain language had an attributed likelihood ratio still closer to the literature based ones (aLR=3.0; 2.25-9; P=0.228 compared with group 2). In this study we evaluated general practitioners' knowledge of terms commonly used to describe a test's accuracy. Although most identified the correct definitions of sensitivity and positive predictive value, only 22% correctly estimated the (low) probability of disease after a positive test result when told of the disease prevalence in the population and the test's sensitivity and specificity. In the clinical vignette the participants underestimated the diagnostic value of the patient's age. Those who were not provided with data on test accuracy grossly overestimated the diagnostic accuracy of a positive transvaginal ultrasound result compared with data from a recently published systematic review6 and with data provided in the Swiss guidelines on the management of women with postmenopausal bleeding.5 Presenting test accuracy as the positive likelihood ratio expressed in plain language seemed to be more effective for eliciting correct estimates of disease probability than presenting it as sensitivity and specificity. Our findings might overestimate the average general practitioner's performance with our questionnaire because e selected doctors attending educational sessions on evidence based medicine. Their responses might have been affected by their prior knowledge of measures of test accuracy and their presentation. In clinical practice not all wrong estimations of disease probability are of equal importance. Two numerically different estimates may not be clinically different if they lead to the same clinical decision. However, it is difficult to be specific about these thresholds for action as they may depend on many subjective factors. Despite a long tradition of reporting test accuracy in terms of sensitivity and specificity, only a minority of our participants could correctly apply this information. This difficulty in performing the required calculations probably explains their underuse in general practice.7 Rather than blaming doctors for this lack of aptitude, authors of diagnostic test data should reconsider the way they communicate their research data. We showed that presentation of a positive likelihood ratio in simple, non-technical wording improved the participants' ability to estimate accurately the probability of disease. Other ways to present diagnostic data—such as disease probability estimates,8 prediction rules,9 or decision trees 10 11 —should be explored. This study gives no insight into what conclusions general practitioners would draw from a positive ultrasound result in real practice. However, if other considerations do not correct for the observed overestimation of the accuracy of the test, there might be adverse consequences for doctor-patient communication and further action. We thank Wim Verstappen (Maastricht University) for sharing his questionnaire and K S Khan and J K Gupta for providing the outpatient database. Contributors JS, GtR, and LMB initiated the study. GtR and JEF contributed to study design and data analysis. All authors helped to interpret data and write the paper. JS and GtR are guarantors for the study. .Probabilistic reasoning in clinical medicine: problems and opportunities. In: Kahnemann D, Slovic P, Tversky A, eds. Judgement under uncertainty: heuristics and biases.Cambridge:Cambridge University Press,1982:249–267. .Choices, values and frames.Cambridge:Cambridge University Press, Russel Sage Foundation,2000. .Evaluation of outpatient hysteroscopy and ultrasonography in the diagnosis of endometrial disease. Obstet Gynecol (in press). .Abklärung von postmenopausalen Blutungen (PMBP).Schweizerische Aerztezeitung2000; 81:1635–1646. .Systematic reviews of evaluations of diagnostic and screening tests.BMJ2001; 323:157–162. .Academic calculations versus clinical judgments: practicing physicians' use of quantitative measures of test accuracy.Am J Med1998; 104:374–380. .Evaluation of diagnostic imaging tests: diagnostic probability estimation.J Clin Epidemiol1998; 51:1293–1298. .A study to develop clinical decision rules for the use of radiography in acute ankle injuries.Ann Emerg Med1992; 21:384–390. .Evaluating patients with chest pain using classification and regression trees.Fam Pract1992; 9:149–153. .Computer-based models to identify high risk children with asthma.Am J Respir Crit Care Med1998; 157:1173–1180. .Do we know what inappropriate laboratory utilization is? A systematic review of laboratory clinical audits.JAMA1998; 280:550–558. .Why we need large, simple studies of the clinical examination: the problem and a proposed solution.Lancet1999; 354:1721–1724.